Bienvenue ! ¡Bienvenidos! As the members of the 2016-2017 Student Council of AIS, we'd like to be among the first to welcome you to our school! As you may have learned by now, our campus is a unique place for us to learn, play, and develop as citizens of the world. We're proud of our school and we love to showcase our talents and skills for the AIS, Austin, and global communities. This section of our website will provide you with more information about the day-to-day happenings at our school. There's a lot going on throughout the year! From assemblies to field trips and from International Week to STEAM Week, we have it all! Representatives to the Student Council are elected each year and we represent all students from PS through CM2. There are two representatives from each class from CE2 up who voice the extracurricular hopes, needs, and dreams of the students at Austin International School. We help organize projects and events, while encouraging democratic participation and striving to promote good citizenship. We're proud of the work we do to help the school grow with us! We meet with the school Administration every two weeks to propose, discuss, and develop our projects. We are excited to represent our fellow students, organize events, and present our projects. We report back to the student and faculty bodies during our regular assemblies, which families are also welcome to attend. Thank you again for visiting our school and for taking the time to learn more about being a student at AIS! À bientôt ! ¡Hasta pronto! As we wind down our summers, don't forget to order your school supplies! 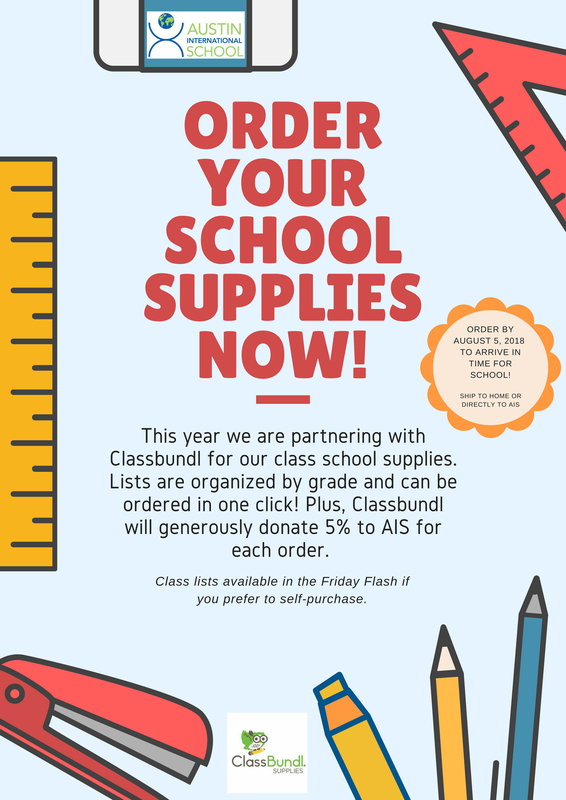 To order your class school supplies you are encouraged to utilize our new one-click online supply vendor, Class Bundl, by clicking here or through the announcements in your Renweb Parent Portal. Ordered Items may be delivered either to your home or directly to the school. Please note there are a few additional items found at the top of the class lists for some grades requested by our faculty but not available from the supplier. So, thank you for purchasing these items separately. All supplies not delivered to the school may be brought to school at Meet the Teacher on Tuesday, 8/14/18 from 1-4 pm. If using the online service, please note the online order deadline is Sunday, August 5th to get your supplies in time for the first day of school. Don't forget our partner retailers, Amazonsmile and Office Depot/OfficeMax will donate to the school if you select AIS as your recipient charity for all purchases made throughout the year. You can find Amazonsmile information here, by choosing Austin International School Association as your charity of choice and logging into Amazonsmile.com each time you shop at Amazon for all your shopping needs. For OfficeDepot's Give Back to Schools program, find our school name and ID#157608800. Thanks for participating in our effortless giving programs!